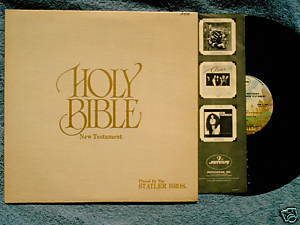 Phonogram/Polygram SRM 11052 Statler Brothers Holy Bible New Testament LP includes gospel written by American Cowboy Music Company; tracks include Who Do You Think?, The Kingdom of Heaven Is at Hand, Beat the Devil, The Brave Apostle Tweleve, The Teacher, The Lord's Prayer. Produced by Jerry Kennedy. Vinyl is excellent; cover is VG with minor corner wear.